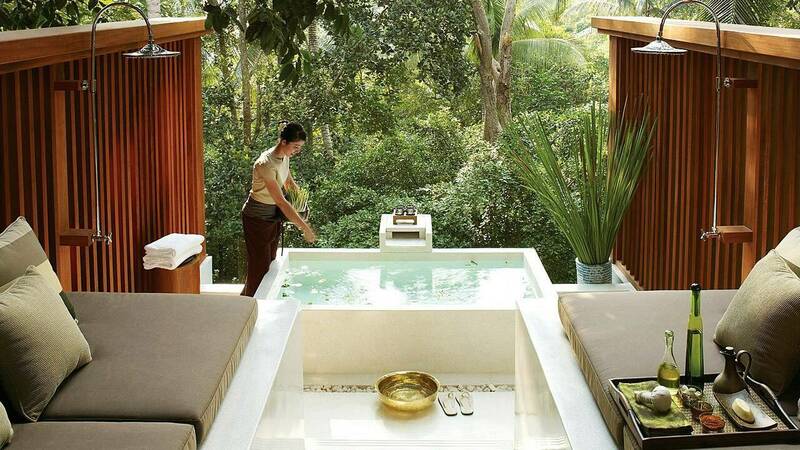 Today (August 4, 2014): top 10 best spa & health retreats in the world. From time to time, the discerning traveler needs a retreat to relax, a sanctuary to unwind, a place to escape from the busy humdrum of daily life. The world’s most exclusive hotel brands are well aware of this, and offer a diverse range of luxury spa packages to pamper their high-end clients. Some ultra-luxurious hotel brands, such as COMO hotels and Six Senses Hotels, are even building their empires around health and wellbeing. So put on your spa robe and get ready to revitalize your body, mind, and soul at my selection of the top 10 best health spas and wellness centers in the world. 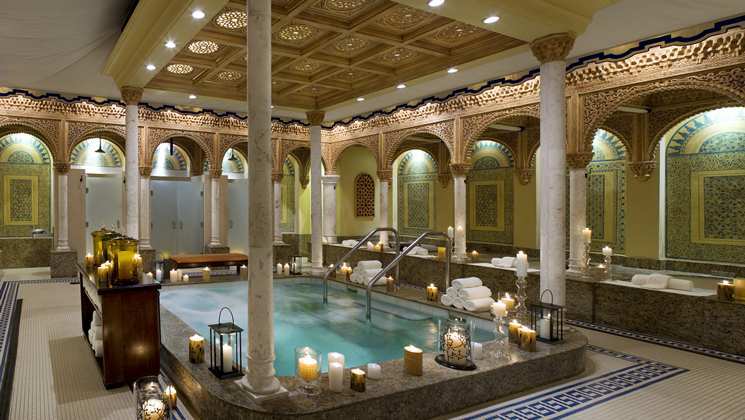 The deluxe Waldorf Astoria Spa was built to resemble The Alhambra Palace in Spain and offers over 50,000 sq ft of stunning architecture, grand arches, elaborate mosaics and luxuriant surroundings. With over 44 treatment rooms and a vast range of signature treatments, the Waldorf Astoria Spa with its 10,000 sq ft spa pool and luxuriant gardens provides the perfect Florida retreat. You can choose from an impressive selection of facials, massages, baths, wraps and scrubs to improve overall health and well-being. Or indulge in signature services, including the Ritual Bath, designed to take you on a journey of unparalleled tranquility. Committed to providing an unforgettable wellness escape, the Iridium Spa at the St Regis Mauritius unites a timeless design, sparkling chandeliers, and elegantly crafted, private spaces with warm, metallic accents and incandescent garden views that evolve daily as the sun passes over the paradise island. Offering a spectrum of services customized to meet differing needs, the 12 treatment rooms invite guests to relax as professional therapists work to revitalize the body, mind, and soul. Lounge-style seating and library programming impart the opportunity to relax pre or post treatment. Meanwhile, healthy food—ranging from sushi, sashimi, and Japanese stew to garden salads and vegetable prawn tempura—and beverage options provide energizing nourishment. Other top 10 accolades: St Regis Mauritius also features in my list of the 10 best resorts in Mauritius. Tip: enjoy free VIP amenities when booking via Virtuoso (e.g. room upgrade, daily breakfast, 85 EUR food & beverage credit, daily buffet dinner for two guests in Le Manoir Dining Room or three-course a la carte dinner for two guests in either Floating Market or The Boathouse Bar & Grill, a 25% discount at Atsuko, early check in and late check out). Review: to read my review of The St Regis Mauritius, click here. High above the bustle of Midtown Manhattan, you can relax in the serenity, luxury and refinement of the award-winning Peninsula Spa at the Peninsula Hotel. You can experience spa treatments that are therapeutic, timeless and which offer an ideal retreat from the demands of the city. Leave the world behind and try one of the popular facials by the French luxury skincare line Biologique Recherche or opt for the ultimate in relaxation with the signature deep tissue experience. 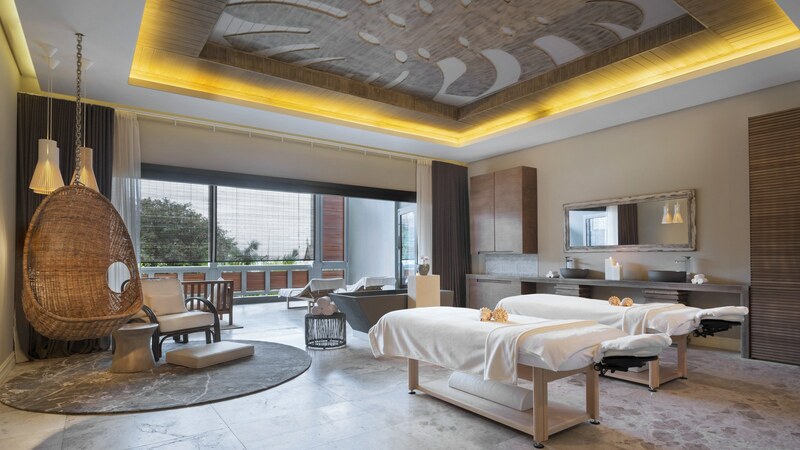 The spa features a stunning collection of 10 treatment rooms including a spacious private spa suite, nail care suite, men’s and women’s private relaxation lounges, an Asian tea lounge, and changing rooms with luxurious heat experiences. The spectacular Tschuggen Bergoase Spa, next to the Tschuggen Grand Hotel in Arosa, is our favorite spa in Switzerland. The architects used white granite, Canadian maple, glass sails and connecting bridges to create a state-of-the-art wellness area that blends in well with its stellar surroundings. The spa and wellness facilities include – amonst others – an indoor and outdoor relaxation pool, spacious relaxation areas with 4 sun terraces, sauna area with separate ladies’ sauna, chill-out lounge with fire-place, 12 individually appointed treatment rooms (for massage, baths and beauty treatments) and a mountain sauna with snow terrace, bio sauna, steam room, ice and shower zone. The beachfront Luna y Mar Spa is ideal for pampering with 10 private spa treatment rooms fashioned into round pod-like dwellings opening into the outdoor spa pool. You can enjoy a treatment with your loved one in the lavish couple’s suite and extend your experience by indulging in spacious private facilities featuring a fill and drain bath tub and a private pool with inspirational ocean views. The spa also offers aquatic water therapy treatments and personalized sound therapy sessions designed to tune the body for a deep state of relaxation. Within the resort spa facility you will find quiet and active private lounges for ladies and gentlemen, separate wet areas with sauna, steam, ice room and whirlpool. Tip: enjoy free VIP amenities when booking via Virtuoso (e.g. room upgrade, daily breakfast, early check-in, late check-out, $100 USD spa credit, and complimentary VIP Airport Tickets with all beachfront suite bookings). 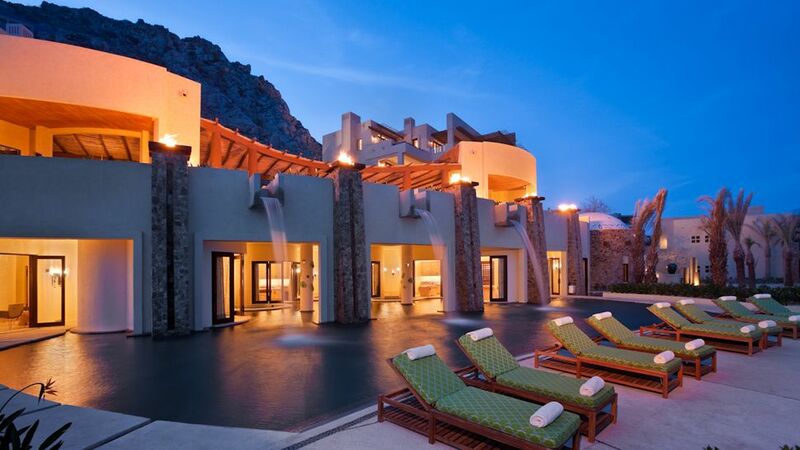 Review: to read my review of The Resort at Pedregal, click here. Here, amid the gentle sights and sounds of the jungle, far from hectic urban life, you can experience a delicate balance of refreshment for mind, body and beauty. The Spa’s nurturing treatments rely on centuries-old healing techniques and herbal and holistic remedies deeply rooted in Thailand’s rich spa heritage. Individual spa treatment rooms are housed in five salas – covered verandas – each with two indoor and two outdoor Thai-style massage beds, an outdoor shower, an outdoor bathtub, and a steam room or indoor rain shower. A separate treatment sala is available for facials, waxing and other services. 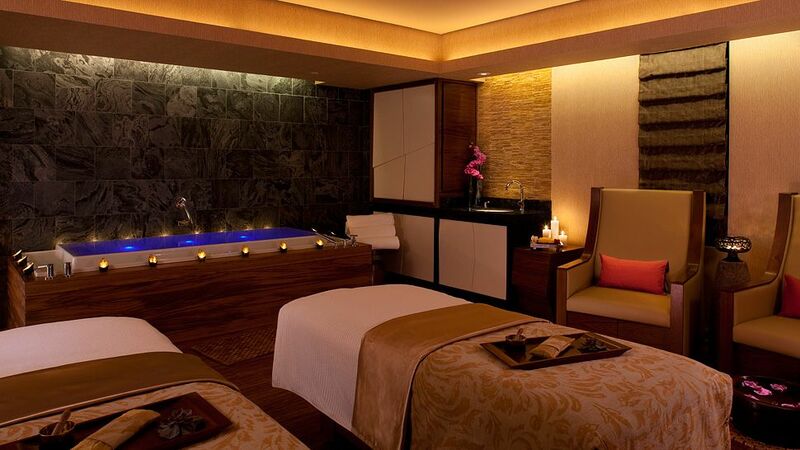 Afterward your treatment, you can sip a tropical juice and savour the feeling of serenity in the Spa’s relaxation sala. Other top 10 accolades: The Four Seasons Resort Koh Samui also features in my top 10 lists of the most spectacular cliffside resorts in the world and the best luxury hotels in Thailand. Tip: enjoy free VIP amenities when booking via Virtuoso (e.g. room upgrade, daily breakfast, and $100 USD spa credit). Review: click here to read my review of The Four Seasons Resort Koh Samui. Wellness is not taken lightly at the spectacularly located Six Senses Zighy Bay Resort. 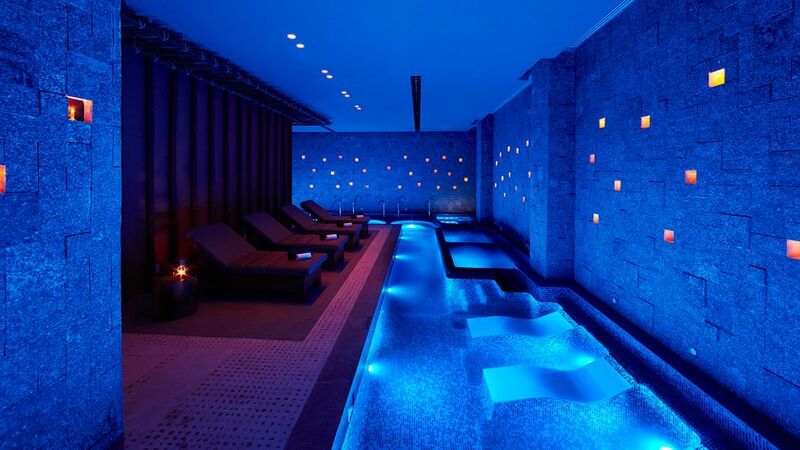 It is a refuge for mind and body, a retreat from the busy humdrum of daily life, and a sanctuary of ultimate wellbeing. Committed to delivering integrated wellness experiences along with peace, tranquillity, fitness and health, the Six Senses Spa offers innovative and ancient holistic treatments from expert in-house and visiting wellness consultants. Besides traditional therapies such as Thai massages, stretching and acupressure techniques that will encourage relaxation and open energy channels for the feeling of wellbeing, the resort also offers locally inspired treatments inspired by age-old Omani traditions, hereby using plants, herbs and ingredients indigenous to the local area. Other top 10 accolades: Six Senses Zighy Bay also features in my top 10 lists of the best luxury hotels in Oman, the world’s most amazing beach hotels, and restaurants with views that match the food. Review: to read my review of Six Senses Zighy Bay Resort, click here. Banyan Tree Spa brings its award-winning blend of Asian therapies, featuring massages and body treatments inspired by traditional Asian healing disciplines, to the Americas at Mayakoba. As a spa innovator, Banyan Tree Spa Mayakoba introduced ‘the rainforest’, a complete hydrothermal experience combining the best of European spa and hydrothermal therapy with the essence of Asian wellness philosophy to create a haven of serenity, warmth and comfort. Banyan Tree Spa therapists undergo formal training at Banyan Tree Spa Academies in Bintan in Indonesia, Phuket in Thailand and Lijiang in China, ensuring that each spa experience is of a high level of consistency and quality that Banyan Tree Spa is renowned for. Other top 10 accolades: Banyan Tree Mayakoba also features in my top 10 lists of the most amazing hotel lobbies in the world and the world’s best family hotels. Tip: enjoy free VIP amenities when booking via Virtuoso (e.g. room upgrade, daily breakfast, $100 USD resort credit, preferential green fees at the El Camaleon golf course, 10% discount at our Banyan Tree SPA, early check in and late check out). Review: to read my review of the Banyan Tree Mayakoba Resort, click here. Together with ESPA, One&Only has created a luxurious island spa retreat, where tension dissolves with the gentle ebb and flow of the ocean as the cares of the world outside quietly drift away. Here, on idyllic sandy shores, you can succumb to the expert care of therapists trained in ancient healing philosophies and modern-day sciences. Luxurious treatment villas, nestled beneath thatched roofs each with spectacular ocean views, provide a perfect tranquil space for an individualised, holistic wellness journey. Facilities include swirling vitality pools, crystal steam rooms, saunas, stimulating ice fountains, exotic spa cuisine, a delightful juice bar and relaxation pavilions. Other top 10 accolades: One&Only Reethi Rah Resort also features in my top 10 lists of the best resort in the Maldives, the most astonishing beach retreats in Asia, and luxury hotels loved by celebrities. Tip: enjoy free VIP amenities when booking via Virtuoso, such as villa upgrade, daily breakfast, early check-in, late check-out, and exclusively designed Reethi Rah Kaftans, coupled with a One&Only Maldives at Reethi Rah Signature Organic Candle. With a minimum stay of 7 nights, guests booking through Virtuoso also receive a complimentary ‘Secrets of the Thila’ excursion or a complimentary dinner for two in the Reethi Restaurant excluding beverages. Review: to read my review of the One&Only Reethi Rah, click here. More than any other spa resort in the world, the COMO Shambhala Retreat at the COMO Shambhale Estate near Ubud (Bali) provides a completely immersive, 360-degree wellbeing experience. Besides spa classics such as massages, guests can also opt for authentic Ayurvedic programmes or a traditional cleansing ceremony, where guests immerse themselves in the sacred waters of renowned Tirta Empul temple at nearby Tampak Siring. A priest then complete the purification through prayer and a blessing in the inner temple. In keeping with COMO Shambhala’s principle of discovery and renewal, the resort regularly invites visiting Masters to lead specialist weeks, including yoga retreats. 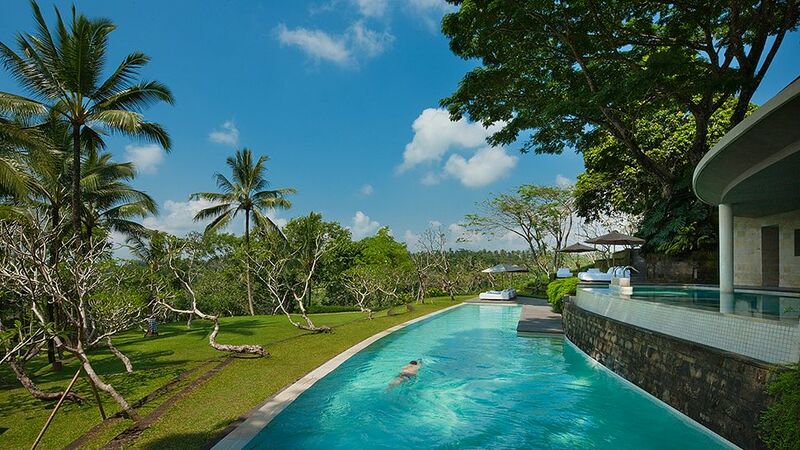 Other top 10 accolades: COMO Shambhala Estate also features in my top 10 lists of most beautiful hotel pools in the world, the world’s best rainforest retreats, and the best luxury hotels in Bali. Review: to read my review of the COMO Shambhala Estate, click here. I vote for Bad Ragaz in Switzerland. Thermal water and stellar facilities. So deluxe!